We believe data is incredibly important to being successful with Facebook Messenger. Here is an overview of the stats we offer and what they mean. 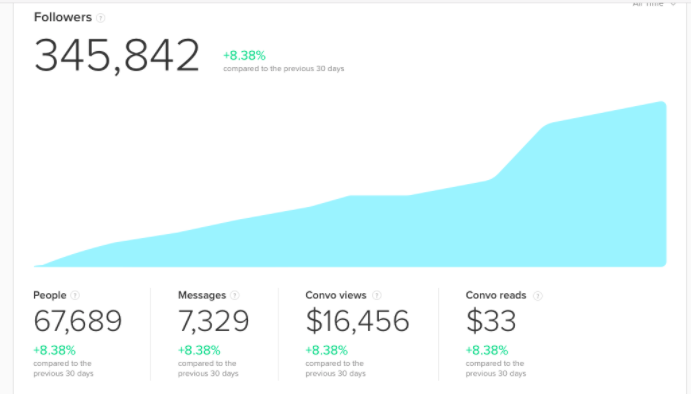 Revenue - Total income earned through your bot, including revenue from abandoned cart messages and in-bot discovery purchases. Increase the total number of customers by promoting your bot and gaining more followers. Increase the average number of times each customer buys from you by creating promotional flows with discounts and special offers. Increase the average order value from each customer by suggesting similar products and complementary goods. Customers - The number of people who purchased your products through the bot. Products Bought - Items purchased through Facebook Messenger. Orders -Number of orders driven by abandoned cart messages in the selected time period. Average Order Value - Average dollar amount spent per customer order. Carts - Notifications sent about abandoned carts including First and Second Reminder messages. Revenue - Income gained from purchases driven by abandoned cart messages. Orders - Number of orders driven by abandoned cart messages, displayed along with a percentage of recovered carts. Average Order Value - Average dollar amount spent for each customer order driven by abandoned card messages. Learn more about the Abandoned Cart feature in this article. Products viewed - Number of times a product is viewed within the bot in a Convo or a trained bot recommendation. Products Bought - Number of products sold within a bot, excluding abandon cart conversions. Revenue - Income from products purchased within a bot, same as above excluding abandon cart conversions. 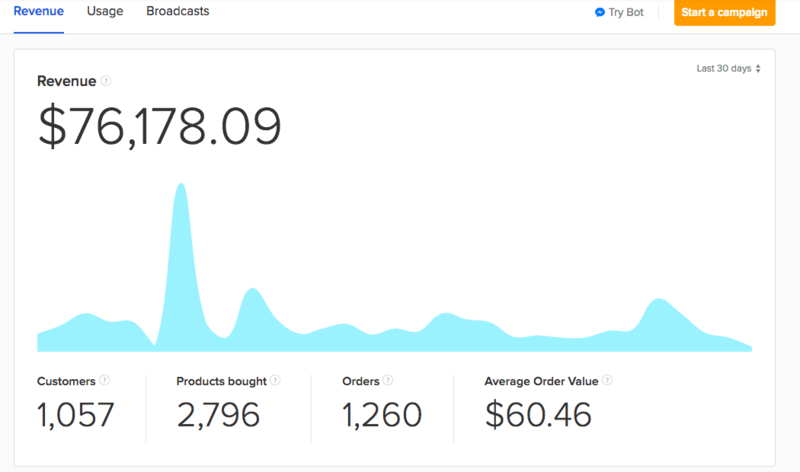 Average Order Value - Average dollar amount spent for each customer order within a selected period for products sold within the bot. Learn more about how you can add products for sale in the Convo in this article. Followers - Number of people following your bot. The more followers you have the more people you can message when you have news. People - Number of people interacting with your bot. Interaction refers to clicking on any menu item, replying or clicking on quick reply buttons. Messages - Number of individual messages sent to your bot. Convo views - Total views of the first section of your Convo. Views indicates how many people started a certain Convo. Learn how to create convo in this article. Convo reads - Reads indicate the number of people who got to the last section of a Convo. It is the total views of the last section of your Convo. Find out best practices on writing Convos in this article. Talking with your bot - Number of overall people talking with your bot. Use Campaigns to increase these numbers. Messages - All time messages sent to your bot. Convo views - All time convo views. To increase this number learn more about Convo recommendations. Convo reads - All time convo reads. Lear how to share Convo with your followers in this article. Gender Breakdown - Number of female, male, neuter followers.